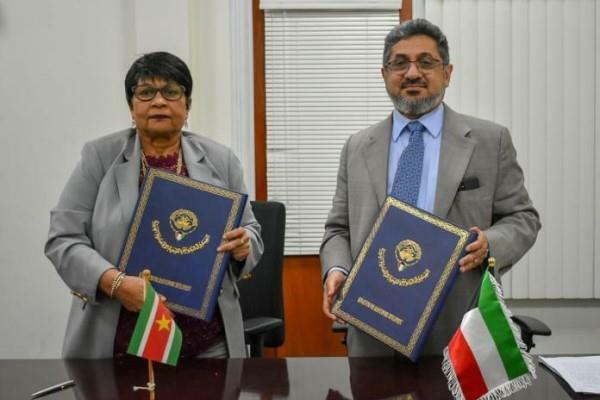 PARAMARIBO, Suriname – According to a press release from the Kuwait Fund for Arab Development, on March 31, a loan agreement was signed in Paramaribo between Suriname and Kuwait. The fund will make available a loan of Kuwaiti Dinars (KD) 5 million (equivalent to about US $17 million) to assist in financing the expansion of power generation, transmission and distribution networks project of the country. A project administration agreement relating to the project was also signed between Suriname National Electricity Company (EBS) and the Kuwait Fund. This is the first time that Suriname is receiving a loan from the Kuwait Fund, and it marks the start of closer ties with Kuwait. On behalf of Suriname, Roline Samsoedien, the acting minister of finance signed the loan agreement, while Marcel Eijindhoven MSc, chief technical officer and Adnan Ismanto, chief financial officer of Suriname National Electricity Company (EBS) signed the project agreement on behalf of the company. Marwan Al-Ghanem, deputy director-general for operations of Kuwait Fund for Arab Economic Development, signed both the loan and project agreements on behalf of Kuwait Fund. The project aims to improve the living conditions of Surinamese and also to enhance the competitiveness of domestic producers and exporters. This will be achieved by expanding and upgrading power generation, transmission and distribution of the power systems to meet growing demands for electricity the release said. The project is expected to be completed by the end of the year 2023. The total cost of the project is estimated at Suriname dollars 1.1 billion, equivalent to about KD 44.6 million. The term of Kuwait Fund Loan is 20 years, including a grace period of four years. The loan bears interest at the rate of 2.5 percent per annum in addition to a service charge of 0.5 percent per annum for meeting administrative costs and the expenses of implementing the loan agreement.